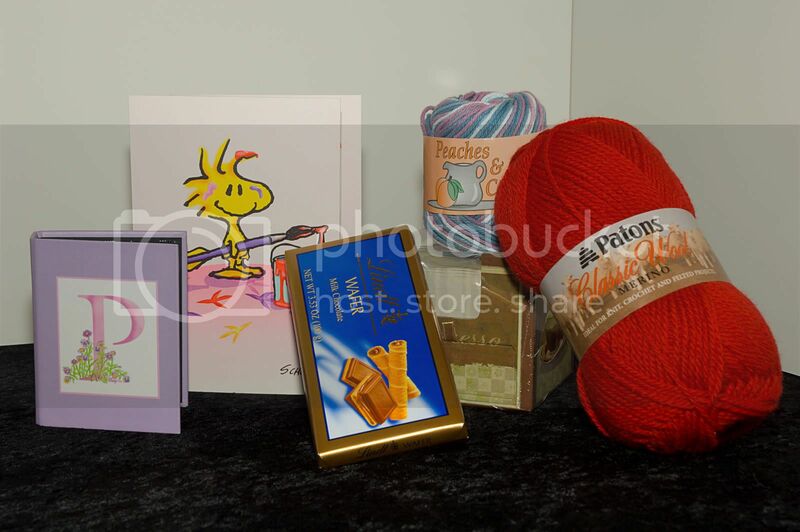 An adorable Woodstock card, a mini photo album with my initial on the front, a notepaper cube (with a little drawer in the bottom), chocolate (Lindt Milk Chocolate with wafers… mmmm), some Peaches ‘n Cream cotton in a lovely dusty pink, plue, and white mix, and some bright red Paton’s Classic Wool. Thank you thistlerain!!! 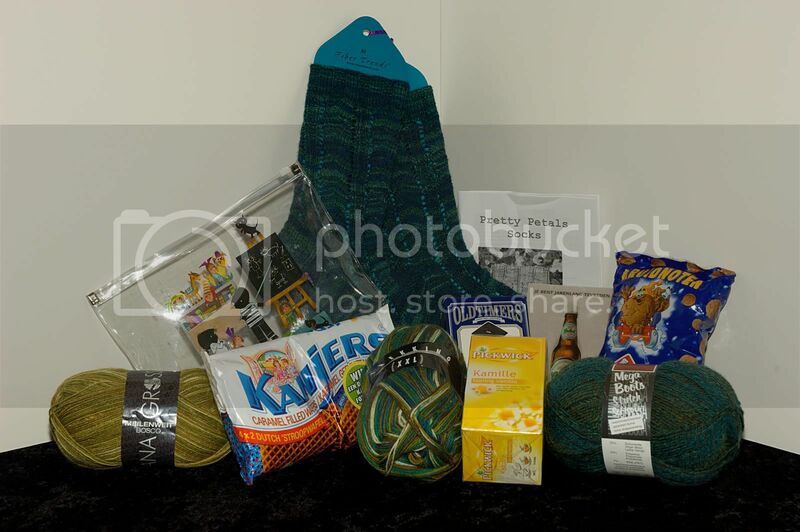 Another package arrived while I was dealing with the Comcast mess – my sock swap package from Jenneke!!! My bee-YOOOOO-tiful socks (which fit perfectly, but I wasn’t putting my feet up on the table, so I’ll have to get a modeled shot later), the pattern for said socks (in case I needed to re-do any part of them), a zipper case with some artwork from a Dutch kids’ book, THREE skeins of sock yarn (all gorgeous), a Grolsch beer postcard (clearly, Jenneke knows me well), and some Dutch goodies – some caramel waffle cookies, salty licorice (apparently a love-it-or-hate-it thing – I’m intrigued but haven’t actually tried it yet), honey vanilla chamomile tea, and Kruidnoten (sp?) – cookies that are only available around Christmas. Thank you so much for everything, Jenneke – it’s lovely, and it’s been a blast getting to know you! I’ve made some good progress on my Fair Isle cardigan (on stripe #14 of 18 on the body) – I’ll try to get a picture tonight or tomorrow. There must be a magic age before which you need to first try some of these “regional specialties” like marmite and salty licorice. Kind of like learning a second language. I love those sockies, and GLAD you’re back with internets! What lovely packages and just at the right time too. That’s some Dutch lovin for ya indeed!